Smashing Pumpkins is a work all about how to film a falling pumpkin, make an action painting, and reference time-slice photography. 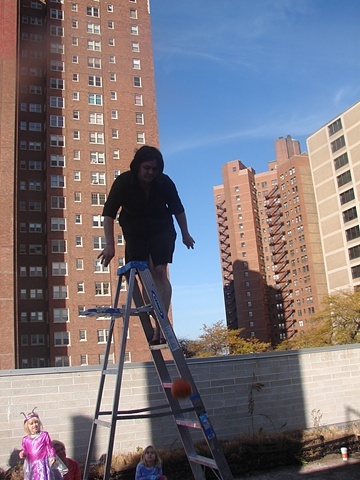 Making use of 30 pumpkins, a ladder, a video camera, a digital sound recorder, a canvas, and a performer, I placed a ladder in the center of a circular perimeter (the splat zone). Around the splat zone, 30 marks were made, each one corresponding to a pumpkin drop, and a video camera was moved to each mark so each splat was shot from a different angle. The pumpkins were dropped one at a time, splatting onto the canvas. Smashing Pumpkins was edited using the visual effect known as "bullet time," which was popularized by the movie The Matrix. This technique is achieved as an expansion of a photography technique known as time-slice photography. As Smashing Pumpkins is an intersection of multiple acts rather than one, the time slice taking place mid-drop was generated by the 30 pumpkins in the performance, creating an imperfect animation effect that represents the performance as a whole. Additionally the canvas covering the splat zone was preserved as a painting and will eventually be stretched.